The beach front horse races continue, and Hrothgar steps into the crowd. What I’m fixated on in this passage is how the poet describes Hrothgar. Sure, there’s the stuff about the men still racing on the sand and the sun light rushing out over the horizon and all that, but I think that there’s more to be said about Hrothgar here. So, let’s look at his intro. He’s said to be coming from the bedchamber “with a sense of leading an army” (“tryddode tirfæst getrume micle” (l.922)). This is my interpretation of the phrase, which Heaney (the main translation I’m using as my base since it’s poetic yet strives to be “Anglo-Saxon” where it can) seems to just gloss over. Heaney renders the same Old English (as far as I can tell) as “Walked in majesty…with a numerous train” (ll.921-922). The sense of these two is definitely similar, but I think that mine is hitting on a bit more of the satire or caricaturization that might be going on here. Maybe I just can’t believe that Hrothgar still holds power despite his failing to oust Grendel over the course of 12 years. Not to mention the poet’s chiming in twice now that the stories of Sigemund and Beowulf aren’t meant to bring down Hrothgar’s authority. Anyway, Heaney’s rendering of that bit of line 922 shares in attributing majesty to Hrothgar, and I think that’s definitely what’s going on here. But I think that what’s important but missing from Heaney’s translation is what gives Hrothgar the sense of majesty: being at the head of an army (“getrume micle”). This is important because with it in place, Hrothgar’s character as the fallen warlord is given more detail. Indeed, Hrothgar once walked at the head of armies on the field, but now he merely walks at the head of a train of women coming from the bedchamber. In short, he’s been put out to stud and, not unlike Heremod, has pulled away from battle after being greatly discouraged by Grendel. The overly melancholic Hrothgar of “Beowulf: A Musical Epic” is a bit much, but I think what Victor Davis and Betty Jayne Wylie really picked up on (and emphasized for the stage and the speaker) is Hrothgar’s sense of despair. Though, unlike Heremod, Hrothgar hasn’t become so glum as to put the rest of his court at risk. He’s still able to ask for help and to put out a call, even if it takes twelve years for that call t be answered. More than anything, though, I can’t help but read these few short lines of Hrothgar coming out with Wealhtheow and her attendants as emasculating. I see it this way because there’s just so much contrast with what we’ve just heard about conquest and battle. And not even about the pitched group battle that Hrothgar’s army of old would’ve fought in, but single combat – and single combat with a mythical creature no less. And yet, here we have the formerly glorious warrior king coming out from his bedchamber at the head of a troop of women. It’s definitely still majestic, but I think the poet is really emphasizing what can happen to even the greatest warriors in their old age. Part of this is definitely giving the audience ideas of what could happen to Beowulf down the road. And, yeah, there’s the matter, of the sunlight, too (on line 918). I think that’s just the poet’s way of saying that this, the first post-Grendel dawn, is eagerly awaited because it signifies the real and definite defeat of the monster (light shines again on Heorot!). Plus, the way the light’s said to shove and rush over the horizon suggests to me that this sunrise is a symbol of an aggressive reassertion of the natural order that Grendel had disrupted. Do you think the poet meant to sarcastically glorify Hrothgar here? And do you think the early audiences of Beowulf would pick up on this? In this passage there are a few more compound words than in the past few weeks’. These words’re cool and all that, but none of them are that complex. No doubt this is because the description of the men riding around after the story’s finished is supposed to be a light moment. Not to mention, the sight of a war proud lord leading his wife and her handmaids from their chambers is also probably meant to bring out some smirks before things get serious again with Hrothgar’s speech. The word “swið-hicgende” (l.919) combines “swið” (meaning “strong,” “mighty,” “powerful,” “active,” “severe,” or “violent”) with “hycgan” (meaning “think,” “consider,” “meditate,” “study,” “understand,” “resolve upon,” “determine,” “purpose,” “remember,” or “hope”) to mean bold-minded, or literally “strong thinker.” Though I think the concept is more about having strong thoughts than being one who thinks a lot. Those that this word describes on line 919 are the ones who are leaders because of their ground breaking ideas (no doubt mostly martial, but so what?). Then there’s the compound “bryd-bure” meaning “bride-chamber.” How this combination gets to “bride-chamber” is pretty straight forward since it’s a combination of “bryd” (meaning “bride,” “betrothed,” “newly married woman,” “wife,” or “consort”) and “būr” (meaning “bower,” “apartment,” “chamber,” “storehouse,” “cottage,” or “dwelling”). There are a few little things with this one. Like the idea that a bed chamber could be thought of (maybe exclusively through our perspective) as a storehouse for brides or wives (unless the word’s where the idea for the story of Bluebeard came from). I really like the idea of a bridal cottage, it ties in neatly with the very European-seeming idea of the rural couples retreat, the sense that in a natural setting a man and a woman who are married will be able to rekindle their spark or reconnect. Though that idea itself could go back even to Homer and Odysseus and Penelope’s bed being made of a carved tree that was also what the entire house was built around. Also, a fun fact here is that “bryd” is also how the Old English forerunner of the modern word “bird” used to be pronounced (and, therefore, spelled), so that’s probably one reason why women are sometimes regarded as flighty in Anglo-Saxon derived cultures. Then we stagger onto “medo-stigge” on line 924. This compound for “path to the mead hall” comes from a cocktail of “medu” (simply “mead”) and “stigge” (meaning “narrow path,” “way,” “footpath,” “track,” “road,” “course,” “line”). There’s some sense of the “path to the mead hall” being a little well worn here, but I think that the variety of roads that “stigge” covers simply opens up that possibility rather than actually reflecting anything really meaningful. And, the last of the bunch is the marvelous “searo-wundor” or “strange object.” This one has a little bit more to show. A combination of searo (meaning “art,” “skill,” “cleverness,” “cunning,” “device,” “trick,” “snare,” “ambuscade,” “plot,” “treachery,” “work of art,” “cunning,” “device,” “engine (of war),” “armour,” “war-gear,” or “trappings”) and “wundor” (meaning “wonder,” “miracle,” “marvel,” “portent,” “horror,” “wondrous thing,” or “monster”), this compound holds the secret of how the Anglo-Saxons viewed the world. If “searo-wundor” is any indication, then, just as we still do today, the Anglo-Saxons regarded things that were out of the ordinary both “marvels” and “portents.” I don’t find this interesting because it suggests a connection from the Old English world to the Modern English world via superstition. Superstition is something that every culture has. The thing here is that the doubling of “wundor” suggests that the Anglo-Saxons had some idea that exceptions to the established rules must mean that there are other higher rules we don’t know about. 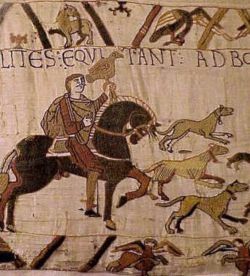 Those, of course, to the Anglo-Saxons would be god’s rules. The funny thing is that even now there’s still a great deal of things that we just can’t account for. A millennium later and we’re still seeking rules when the ones we know are broken. Do you think medieval people had some idea of world order or structure beyond their religious beliefs? In the next passage Hrothgar thanks god and Beowulf alike.